One of Cincinnati's best basketball players is Mt. Notre Dame's senior Gabbie Marshall, a four-year varsity starter, a McDonald's All-American nominee, a member of the 1,000+ point club and a two-time Ohio state champion. Gabbie was second in the league in scoring, averaging about 14 points a game for the GGCL champs (undefeated 8-0 in league play), SWO District champs, Regional champs and 27-2 Ohio state champs. She is also second in the league in steals, averaging 2.8 per game. So far this season, she has been named 1st team all-SWO District in Div. I and 1st team all-Ohio. Her numerous big games this season include games vs. Seton (28 points), Bedford IN (27), Hamilton Heights TN (23), Kettering Fairmont (21) and Milford (20). Gabbie helped lead Mt. Notre Dame in capturing a seventh Ohio state championship, which ties for the most state titles in girls' basketball in Ohio High School Athletic Association history. Gabbie was part of the Cougars' Ohio state championship team her sophomore year and district championship team her junior year, when she averaged 16 points a game (second in the conference) while her three steals per game led the conference. Her junior honors included being named 1st team all-GGCL for the third time, 1st team all-SWO District and 2nd team all-state. A great student who is active in community service, Gabbie will play collegiately at the University of Iowa. Her favorite athlete and most-like-to-meet is Steph Curry, favorite entertainer is Sandra Bullock, favorite book is To Kill A Mockingbird and favorite movie is The Hate U Give. COACH'S QUOTE – "Gabbie has been the cornerstone of our program for four years. 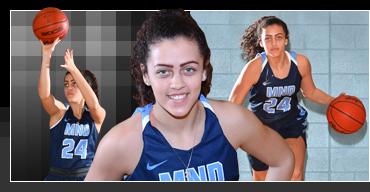 Her contributions on and off the court will be a legacy for all future MND student-athletes to follow. She will flourish at the University of Iowa."